Turn your most signature mark into a work of art with Identity Expression's personalized masterpieces. 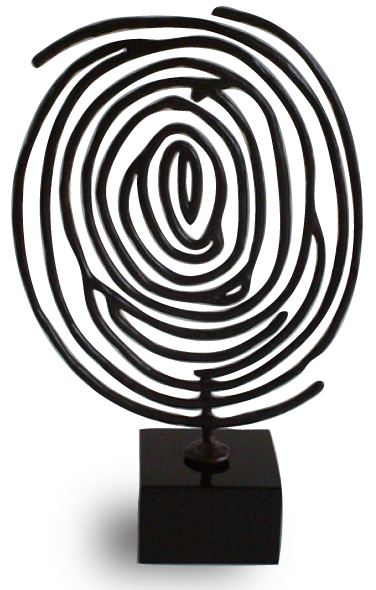 Have the fingerprint of a loved one transformed into a piece of art, and give it as a commemorative gift. As a personalized memento, this unique gift speaks directly to your loved one’s heart, and will truly become a part of their life to be remembered forever. The universal appeal of the fingerprint as both the most deeply personal attribute a person has, as well as a symbol of individual identity makes this metal fingerprint artwork a memorable item to be treasured for years to come. Several styles are available, and whether choosing precision cut or artistically rendered, a fingerprint will serve as a lifelong keepsake of a key moment or landmark event in a loved one’s life. A commemorative fingerprint will express so much of how you feel.